The search found 37 results in 0.075 seconds. The normal retirement age for receiving full Social Security benefits depends on the year of your birth. 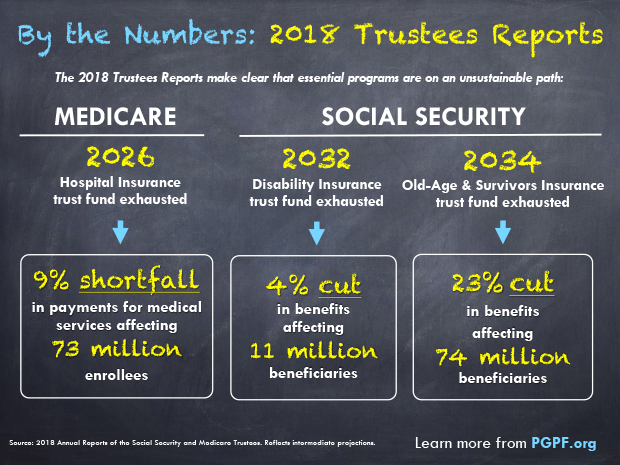 Based on the Trustees' projections, combined Social Security benefits could be cut by 21 percent in 2034 without legislative action. As the population ages, fewer workers will be paying taxes to support each Social Security beneficiary. 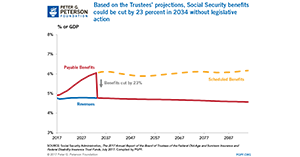 Social Security will run a cumulative cash deficit of $2.9 trillion between now and 2034. Growth in Social Security, Medicare, and Medicaid have more than offset declines in defense since the late 1960s. As the large baby boom generation enters retirement and Americans continue to enjoy longer lifespans, more and more individuals will collect benefits from the system and for longer periods, while relatively fewer workers will contribute taxes to support it. Our most popular charts from 2016 illustrate the nation's fiscal challenges in areas like defense spending, healthcare, and tax reform.